A dependable video best baby monitors are one of the must-haves for new parents. This high-tech device enables you to keep tabs on your baby while you’re in a different room. This gives you peace of mind, knowing that you can monitor your baby’s needs as you go about your day. However, due to the high influx of baby monitor products in the market, it might be challenging to pick which one is best for your needs. We know this and that is why we have created this post to help to make a simple and informed decision. We are going to provide you with all the details you need to know about baby monitors, a comprehensive guide to buying baby monitors as well as a list of the best ones on the market. Read on for more information. Now that you have been introduced to the best baby monitors in the market, let’s tackle some more tips to help you seal the best deal. Here are some shopping tips to guide your purchase. If you need to know whether your baby still moves or not because you’re scared of SIDS or your baby is diagnosed of something risky, go for those baby monitors that alert you when no movement is detected. 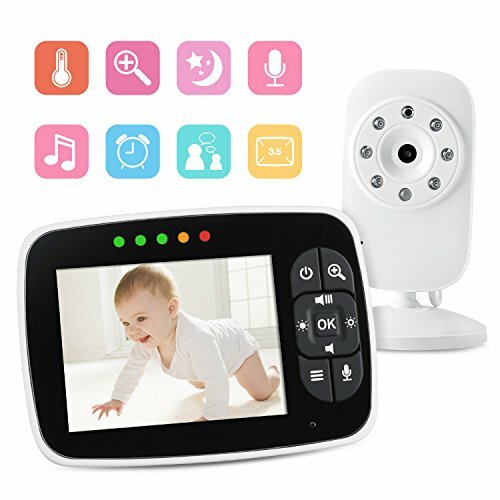 If you just want to keep track of your baby while you’re doing something else in other parts of the house, you can purchase the usual ones with the usual features, like two-way communication, video and image display, sound detection, etc. The perk of choosing digital monitors over analog ones is that digital monitors encode their signals. This way, it’s guaranteed that the images and sounds you receive won’t be transmitted anywhere else—like to your neighbors who have the same model or frequency band. If your house is large, you might want to consider buying a baby monitor with two receivers instead of just one. Your priority should then be to look for units that make it easy for you to move around, like a compact receiver that clips to your waistband or belt. If you usually have to make calls while your baby is asleep, choose monitors with lights, letting you know that your baby is awake. You should know the company’s return policy before making your purchase. You should be assured that you can return or exchange the product in case interference issues and other major problems arise. Install the new device before the retailer’s return period ends, so it won’t expire. If it did expire, you can try your luck and contact the company’s customer support if you can possibly get an exception to the policy. Just be polite and persistent and keep the original packaging and receipt intact. To help all the parents out there, we have listed down below the best baby monitors you can choose from. Lyker Digital comes with an LCD display camera and a 2-way talkback temperature monitoring. The real-time video and audio are clear, and the 2-way video talk enables you to talk and soothe your baby as necessary. Its holding time is pretty long. The coverage is up to 12 hours if you activate the ECO mode. Also, even in dark or low-light settings, you can monitor your baby clearly with its automatic infrared night vision feature. Other features include lullabies that conveniently lull your little one to sleep. The Fredi Wireless Camera Monitor is another great option for you. It is specially designed to provide you with an easy way to monitor your little one or your pet when you are in another room or even outside the home. The high-quality optics of the baby monitor produce top-image quality. Its night vision function is sharp and contrast-rich. It also comes with the two-way talking feature. The baby monitor comes with a comes with a full HD camera that is paired with 1280x 720P resolution at 25fps. The live stream feature can be accessed through an Android device, iOS device, Windows PC Software and even on web browsers. It supports a reliable 2.4G WiFi connection. The WiFi is easy to set up and you can connect through the mobile app on your Android smartphone or iPhone. However, it is important to state that 5G is not supported. One feature that makes the product stand out among that of competitors is the movement and activity detection. The camera features a technology that allows it to send a push message alert to your device when there is a movement in the room. It informs you about the type of movement, as well as when and where it was made. This feature goes a long way to further guarantee the security of your little one and your home at large. Furthermore, the wireless security camera comes with a Micro SD card slot that supports up to 128GB. This is amazing since it allows the recorded clips to be saved and even played on windows without the need to remove the camera from where it is installed. 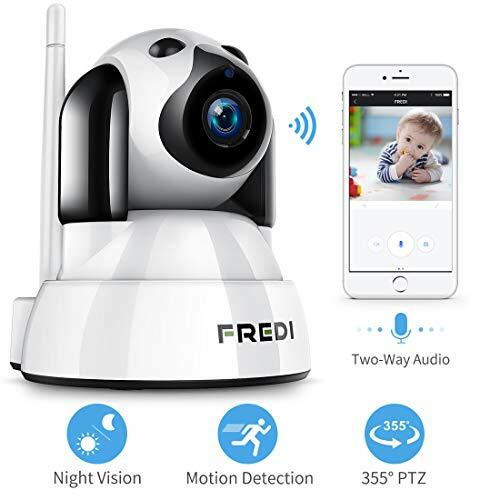 Since the Fredi Wireless Baby Monitor supports 24/7 windows video recording, you can check for details with regards to the security of your home on your computer where the camera is stolen or destroyed. Also, the product provides its users with a wide viewing angle of 355-degree horizontal (pan) and 90-degree vertical (tilt) for a better coverage of your home. It allows you to talk and listen to your little one thereby allowing you to keep him company even when you are not really there. 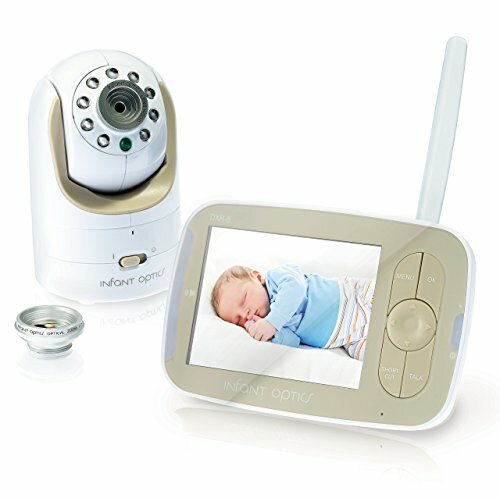 The wireless camera also allows you to monitor your baby even at night thanks to the IR LED night vision of up to 20 feet. Interestingly, the product is also ideal for use in shops, offices, meetings, and the likes. The manufacturer guarantees your satisfaction, security, and privacy with the wire camera. Many users find the product budget friendly. However, some users have complained that the power cord is rather too short. At two feet long, you would really need an extension cord for it. The Infant Optics DXR-8 Baby Monitor is another amazing product on the market. If you’re not comfortable using internet-based baby monitors then this product may be ideal for you. It is an award-winning product for popular mechanics and it has received lots of favorable ratings from past users. It is specially designed to monitor kids but you can also use to monitor the activities of your pets. The unique thing about this Infant Optics monitor is its interchangeable optical lens feature. This is a technology exclusive to DXR-8. It functions by allowing you to customize the performance of the camera by switching different lenses, thereby going for the one that works best for you at a given point in time. This process is simple and will only take you a few seconds to successful switch the lens. The different lenses are a normal lens, optical zoom lens, and wide angle lens. While the normal lens setting provides a clear view with mid-range coverage thus allowing you to view your baby as he plays, the optical zoom lens is ideal for viewing your little one close while he/she sleeps. The wide angle lens functions to capture the entire room thanks to its full 170 degrees panoramic view. This is ideal for toddlers or babies that can already move from place to place. The interchangeable lens feature enables you to zoom and customize the viewing angle. You can remotely tilt, pan, and zoom the coverage effortlessly. It comes with one optical zoom lens, but if you want a wide angle lens, you’d have to buy it separately. There is also an alarm function to alert you that the baby is awake. Design-wise, the unit is sleek and compact with a full-color LCD display. Interestingly, the product is sound activated which allows you to hear your babies found as he plays even from a distance. Also, it features an invisible IR night vision. In terms of battery life, it’s pretty compelling as it can last for around 10 hours in power saving mode. And in terms of range, it does its job well with its reliable and strong signal. You also wouldn’t have a hard time setting it up as it’s pretty straightforward. The plug and play feature it what most moms find fascinating about the product. Unlike many internet paired baby monitors, the Infant Optics DXR-8 Baby Monitor does not require you to set up an account. Also, the product has an instant/zero load time without any lagging for playback on the screen of the monitor that ships with it without the need to use an app on your mobile phone. Furthermore, you don’t have to worry about monitoring your baby. This is because the monitor has about 3.5 inches display that allows you to monitor every activity of your little one no matter how small. The good thing is that, since the product does not require an internet connection to function properly, it may be impossible for hackers to intrude into your privacy. The manufacturer guarantees 100 percent privacy as no video or audio clip is uploaded on the internet. When you purchase the Infant Optics DXR-8 Baby Monitor the package comes with an extra monitor, unit, and charging cable. The slight downside is that it only comes with 1 screw hole, and some parents might not trust the support of one screw, especially if they are to place it on the crib over the baby. Also, the screen is quite small compared to other alternatives, and the price is just a bit on the expensive side. The wide angle lens does not ship with the product, you will have to buy it separately. It also requires 2 AAA batteries to function properly but it doesn’t ship with the product and you will have to buy that too. This is also another best baby monitors product we can recommend. It is designed to help you monitor the activities of your little one when for a reason you are in a different room or outside the house. It can also be used to efficiently monitor the activities of pets in the house. The product is ruggedly built to deliver high performance and durability. It has soft colors perfect for your baby’s room and is made from toxic-free silicone. The item also detects noise and crying, and the video and picture quality is clear day and night. I is easy to use even if you do not have any experience using baby monitors in the past. You also won’t have a hard time figuring out all the buttons and menu as the interface is pretty simple. The device offers information about the air quality of your baby’s room. You can receive an instant app notification to know if something is wrong with the temperature in your baby’s room. Its design also enables you to mount it anywhere, be it on the wall, on the table, or even on the crib. The usual hitch is that sometimes the battery won’t seem to hold a charge, but you can fix this issue by removing the battery for like 30 minutes, replace the battery and plug it back in, and it should hold a charge after. Some users have complained that the product is expensive compared to similar ones on the market. The Snuza Go! Baby Monitor baby monitor is another amazing product you should consider looking at. It is designed to provide you with an easy way to monitor the movement of your little. The product is popular among moms and it has received favorable ratings from past users. The baby monitor is perfect for parents who bring home a premature or problematic baby or for those who are scared of the risk of SIDS. it comes in a beautiful orange color that makes it ideal for both male and female babies. The Snuza Go! Baby Monitor has a premium sensor to be placed next to the abdomen of the baby. It detects even the slightest change or irregularity in the baby’s abdominal movement. Just clip the Snuza Go! Baby Monitor onto your baby’s diaper waistband then switches the device on. You will be alerted if the baby’s movement gets weak or drops at 8 movements per minute or less. When this happens, the device will gently vibrate to rouse the baby. With this product, you can rest assured that your baby’s breathing and movements are monitored wherever you are in the house. Also, you don’t have to worry about putting something that may be too heavy or inconveniencing on your baby’s abdomen as the product is lightweight and portable. The Snuza Go! Baby Monitor weighs only 0.64 ounces with a dimension of 1.6 x 1.6 x 2.8 inches. The good thing is that the product is easy to use and unlike internet paired baby monitors, this one does not require you to use an app or set up an account. The product feature four different alerts including a green light, an orange light, an orange light with a dual beep every second, and a red light with audible alarm. The green light signifies normal abdominal movements, while the orange light symbolizes small or weak abdominal movements. An orange light with a warning sound every second is a way to inform you that the movement rate of your baby has fallen below 8 movements per minute. However, the product allows you to disable the alert. The red light with audible alarm signifies that there is no detection of abdominal movement for a chosen period of time which may either be 15,18 or 20 seconds. The products require 1 CR2 battery to function properly but you don’t need to worry since it ships with the product. Also, the Snuza Go! Baby Monitor comes with a protective case in which you can store the product when not in use. Just don’t be surprised if it doesn’t work when your baby is in his swing, car seat, bouncing seat, or anything that moves. The device picks up any movement in general and not solely your baby’s movement. Also, there may be times that it slides off the diaper. Some users complain that the product is too pricey compared to similar ones on the market. The Philips Avent DECT Baby Monitor is one of the best baby monitors on the market. It is an audio-only product designed to provide you with an insight on your baby’s movement during the day and at night. It may also be ideal for use with babies that are able to move from place to place. The product uses DECT technology which guarantees no interference, and a wide range coverage of up to 900 feet. This product provides you with a reassurance about your little one’s safety even when you’re not in the same room or when you are outdoors. The manufacturer guarantees a 100 percent privacy considering the fact that the product does not require an internet connection to work properly. This invariably means easy set up since there will be no need to install an app or create an online account. 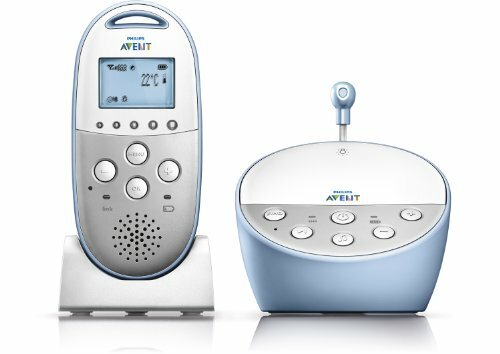 The Philips Avent DECT Baby Monitor also offers a clear sound as you won’t get any ambient noise or static hiss that most baby monitors make. And like other products on the market, you can enjoy talkback feature that allows you to hear and speak with your little one thereby providing you with a chance to keep him/her company even from a distance. It also features a nightlight and lullabies that will help your little one to fall asleep quickly. The product features a vibration alert and LEDs light that signifies the noise levels in your little one’s room. Furthermore, the Philips Avent DECT Baby Monitor comes with a docking station for the parent unit of the device. The parent unit is wireless and rechargeable. For the product to work well, you will need 2 AA batteries which are included in the package. The batteries will last for about 18 hours and the baby monitor is designed to alert you when the battery is low. An outstanding feature of the Philips Avent DECT Baby Monitor is the temperature monitoring technology integrated into the device. The technology functions by alerting you of a temperature change in your baby’s room. This feature is amazing since babies are not able to modify the temperature of their room which may make them restless in your absence. With this product, you will receive an alert when there is a temperature change thereby allowing you to take active steps to ensure your little one’s comfort. Its DECT technology is really good, but if your house has super thick walls and your home’s size is too huge, you may still experience inconsistencies. However, its sound pickup and sensitivity are seamless, and it’s generally a good choice. Some users complain that the product is expensive compared to similar baby monitors on the market. This is another viable option for you. The Smilism Video Baby Monitor is one of the best baby monitors on the market. It is designed with top quality materials to provide you with high performance and durability. This is in addition to providing you with an efficient way to monitor the activities of your little one even when you two are not in the same room. The product affords you the opportunity to watch over your baby while you indulge in other important activity in-house or even outdoors. You can enjoy smooth two-way talk feature which allows you to hear and talk to your little one which may provide him with a soothing feeling that you are nearby. The top quality audio will allow you to clearly hear your little one and vice versa. The Smilism Video Baby Monitor also features an automated infrared night vision which is automatically activated when the day becomes dark thereby allowing you to see and monitor the wellbeing of your baby even at night. The zoom in the feature will further provide you with a clear view at night. Interestingly, the product comes with four integrated lullabies that will do a great job comforting your little one thereby allowing him to quickly fall asleep. 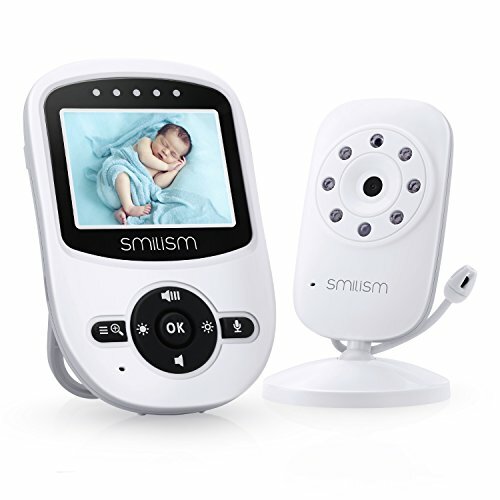 Furthermore, the Smilism Video Baby Monitor has multi-camera expandability, and its temperature sensor guarantees that your baby is always restful and cozy. It comes with a 2.4 inches monitor with a high-quality display that allows you to clearly few the image of your little one. 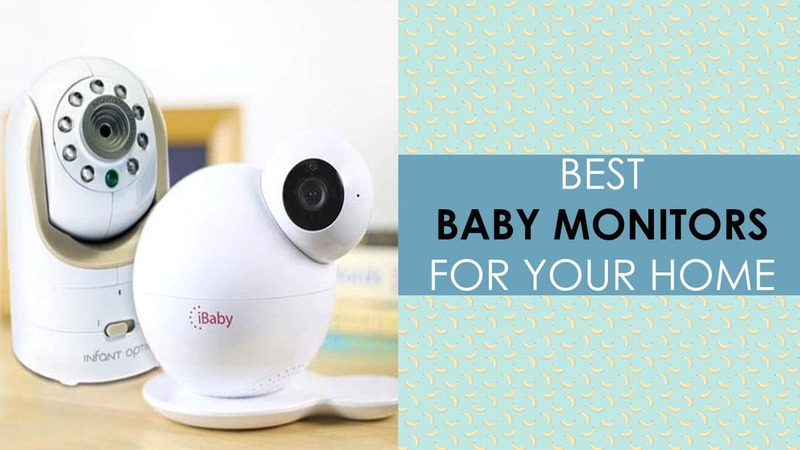 It has a manual pan of 360 degrees and a tilt of about 60 degrees thereby given you an option to position the baby monitor in a way that works best for you. The LEDs integrated with the monitor can alert you with regards to the level of sound activity and noise in your baby’s room. This feature allows you to easily glance on the monitor to confirm your little one’s well being. The Smilism Video Baby Monitor also features an integrated temperature sensor that allows you to monitor the temperature of your little one’s room. This feature is amazing as it gives you an opportunity to quickly modify the temperature of the room before it becomes uncomfortable for your little one. The product has a long working time of up to 12 hours, thanks to the ECO mode feature that comes with it. The eco mode feature functions by turning off the display screen of the monitor when no voice is detected from your little one’s room to help to save battery power for longer use. The display of the monitor is automatically switched on as soon as a voice a detected in the room. The Smilism Video Baby Monitor has a coverage range of up to 900 feet in open space with out-of-range warning. It is also easy to use and easy to set up as it does not require you to sign into an app or create an online account. The manufacturer of the product guarantees the privacy and security of you and your little since it does not require an internet connection to function properly. It requires Lithium Metal batteries to work and these are included in the package. Other things included in the package are 1 x parent unit, 1x baby unit, 2x power Adapter x 2 with 100 – 240 input Volts and user manual to make it easy for you to operate the product. However, the common issue is its volume, which can be a bit too low. Some users complain that the product is expensive compared to similar baby monitors on the market. Also, the Smilism Video Baby Monitor cannot be remotely controlled. The Babebay LCD Baby Monitor is another amazing product on the market. It is designed with the comfort of you and your little one at heart. The strength of the product lies in its very long transmission range. You can go about your day-to-day chores at home without being chained to your baby’s crib. The device instantly falls into sleep mode if no activity is detected, but it will automatically start up again if your baby begins to move around. The feature of the baby monitor helps to save battery life there allowing for a longer duration of use. Its battery capacity is large, so its lasting time is better than other brands. It’s got a big LCD screen display that shows vivid pictures and video – thanks to the baby monitor that comes with a large display coupled with a 2x magnification feature. This invariably means you will clearly see everything your little one is up to. It also has the two-way talk feature to help you comfort your baby with your voice when necessary. The Babebay LCD Baby Monitor comes with 4 handy and lovely lullabies to help comfort your baby and help him fall asleep quickly. The product also features a long-range connection that will allow you to freely move around the house without the fear of losing connection to the parent monitor. The integrated timer clock feature will be useful for reminding you of your little one’s feeding time thereby ensuring that you don’t miss any feeding. The timer can be set at 2 hours, 4 hours or even 6 hours. It requires 1 Lithium Polymer battery to function properly which is included in the package. Also, it alerts you when the battery is low or when you are out of range. The Babebay LCD Baby Monitor features an automated infrared vision that is automatically triggered when the room is dark. This feature allows you to clearly see and monitor the activities of your little one at night. It also comes with a temperature sensor that alerts you when there is a change in the temperature of your little one’s room. This provides you with an opportunity to quickly modify the temperature of the room before it gets uncomfortable for your baby. The product is easy to use and easy to install and setup – thanks to the fact that you don’t need to create an online account or sign into an app. The product also provide complete privacy and security from hacking activities since it does not require a connection to the internet to function properly. Other items included in the package are 1 x Parent unit, 1 x Parent unit adapter, 1 x Baby unit, 1 x Baby unit adapter, 1 x User manual and 1 x Screw set for easy installation on the wall. However, some users complain that the battery life is not that long. Others stat that the product has some issues in holding charge. 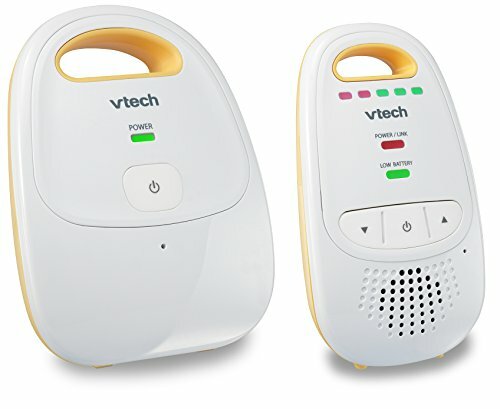 VTech Safe & Sound Baby Monitor is a popular and top-rated product on the market. It is popular among parents which is probably due to the amazing features it brings to the table for you and your little one. The product has a talk-back intercom for 2-way communication that allows you to hear and talk to your baby even when you are not in the same room. It also features a night-vision viewing option (without flashing or blinking lights) to avoid disturbing your baby while asleep. You can also expand the system to use 3 more cameras if you want, and installing the device is a breeze. It also has other common features like temperature sensor, motion and sound activation, and vibration mode. Its digital transmission is secure, and its range is pretty good. Its sensitive mic also picks up even the smallest sound sources. The tiny drawback of the VTech Safe & Sound Baby Monitor is that you can’t control the camera at the parent unit, and the camera’s range of motion is kind of limited, but overall, it covers the fundamental functions well. This is another product that lets you know if your baby is not moving. 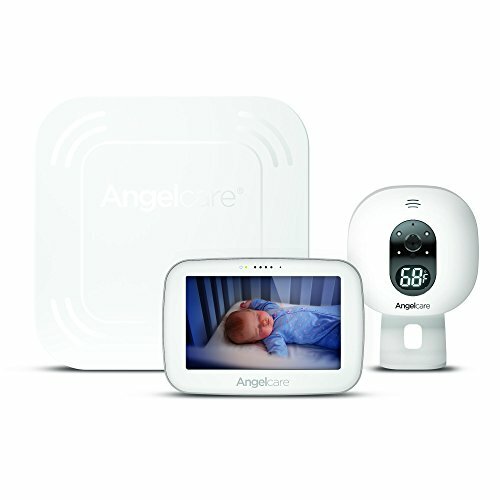 The Angelcare Movement and Sound Monitor will sound the alarm if there’s no movement detected after 20 seconds. The movement sensor pad is really high-quality, so you can worry less and enjoy better sleep. The parent unit is portable and rechargeable, so you can carry it with you wherever you go in the house. There’s a nursery night light which is just a gentle tiny glow to guide parents when they walk into their baby’s room. The sound and imaging quality are great, and it also has temperature sensor alerts. This product is really commendable, but take note that this doesn’t have lullabies. Also, the sensitivity setting might be challenging to set up. Before proceeding to checkout, make sure that the product you have chosen matches your exact needs, and keep in mind that monitors can’t do everything. You also can never substitute adult supervision for these devices. Just consider them as your extra pair of ears and eyes to make sure that your baby is all right. With your tender loving care paired with the right product, you and your baby will surely enjoy the whole journey.